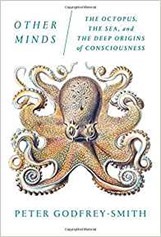 Other Minds by Peter Godfrey-Smith is about consciousness through the lens of cephalopods, a group comprising octopuses, cuttlefish, squid and the nautiluses. Godfrey-Smith is a philosopher, rather than a scientist. This reflects the theme of the book, Godfrey-Smith’s idea is to understand our consciousness by looking at a creature with as radically different a consciousness as he can find. So his book is more a philosophical rather than a scientific view on consciousness which to my mind is no bad thing. I was particularly impressed by Charles the octopus, one of three which experimenters used to try to measure octopus intelligence. The other two octopuses in their study put in some effort to carry out the tests presented whilst Charles insisted on squirting water at the experimenters and being otherwise uncooperative. It does make you wonder whether measures of animal intelligence are more a combination of willingness and intelligence. Perhaps the smarter animals just can’t be doing with intelligence tests. Squirting water at lights in aquariums to put them out seems, apocryphally, to be quite common behaviour amongst octopuses. Mrs H is undertaking a doctorate in education and it strikes me that her mode of doing research, qualitative with relatively few subjects has more in common with this type of study than the experimenters care to admit. In this type of experiment the narrative rather than the result may be more important. So measuring the intelligence of the octopuses, or the time it took them to complete a learning task, is less important than the narrative of how they performed in the experiment. The book weaves together cephalopod biology with Godfrey-Smiths own observations of cephalopods in the wild. I was intrigued to learn that the octopus brain is wrapped around the digestive tract which has been observed to lead to problems when attempting to eat particularly spikey foods. More generally, the neural material of an octopus is not all to be found in the “brain” it is distributed around the body. Octopus legs appear to have a degree of autonomy in at least deciding how to achieve a goal, even if the “brain” decides what the end goal might be. Cuttlefish and octopuses have amazing abilities to change their appearance both in terms of colour, but also physical texture – they can make themselves bumpy. Interestingly, as far as we can tell they are unable to see the colours they produce – the photoreceptors in their eyes are of a single type. However, there is clearly something else going on – photoreceptors are found throughout the body of the cephalopod, and they are able to match background colours exquisitely. Furthermore, with the chromatophore and other colour producing structures also present a different mechanism for producing colour sensitivity is quite feasible – for example using those chromatophores as a filter “wheel” that sits in front of the light sensitive cells. Godrey-Smith highlights that, although the cephalopods have a huge ability to make signals, because they are not a social species their ability to use those signals is limited. This is contrast to species such as baboons who have a more limited ability to generate vocal signals but, as a social species, have a much greater ability to interpret those signals in terms of establishing their position in a hierarchy and understanding how the hierarchy has changed. Close to the end of the book, there is a terrible denouement: the typical cephalopod lifespan is only a couple of years. These creatures, so full of potential, are but brief inhabitants of the earth. Godfrey-Smith draws parallels with the Replicants in Bladerunner here. Their brief lives are understood in terms of their dangerous environment which has led to an evolutionary strategy of large broods of young, easily lost. The book finishes with a discussion of “Octopolis” a location in Australia where octopuses, unusually, congregate and where Godfrey-Smith did a large part of his observations discussed throughout the book. Also we find here that he is involved in scientific publication. Overall, one is left with the feeling of cephalopods having been an opportunity missed in the consciousness stakes. They have all the mental machinery but their truncated lives and limited social behaviour means that in all likelihood the opportunity is unfulfilled. This is a consciousness-centric human view, no species is striving for consciousness or intelligence they are doing what is needed for there species to continue in the niches they find themselves.